Working in the Mobile Health Clinics bus is very interesting, especially if you are a person who loves traveling. Exploring new places whilst working makes work even more enjoyable. It’s always refreshing because you meet new people and clients every day and there is no office boredom. I have fallen in love with this work from the very first day I started because the vehicle is well equipped for our assignment. We do not leave our clients hanging, everything is done in a short period of time, less than an hour. Because everything is done in one area we are a one stop shop and the client does not have to shop around or go to different places. All of this means the client can continue with his/her daily chores and duties because there is no time wasted. What people appreciate most about the mobile service is that it goes to the community and render services there. The communities we work in are happy with the services given to them as they are working during the day so sneaking out during tea break and lunch time to make use of our services is easy, they can even find time to eat before going back to work. Some people have requested that we also render some other services like family planning. 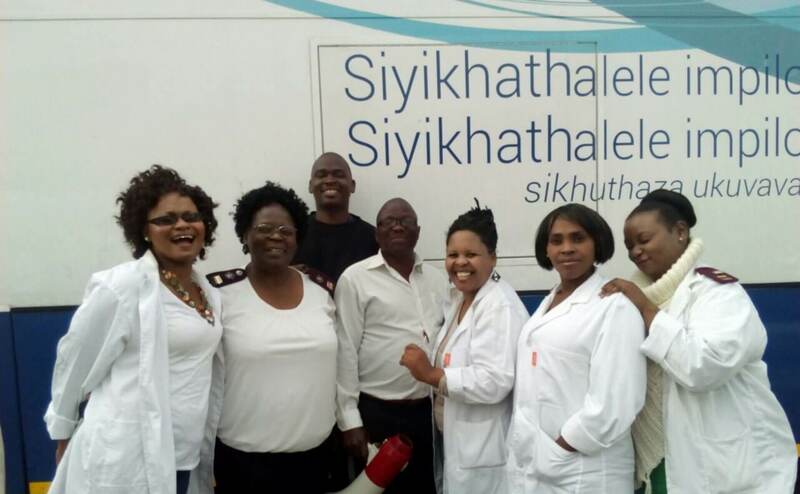 Most of the clients have commented that it is easier to come to our clinic for mobile HIV testing because at their local clinics there is no fast queue for HIV testing. They have to join the normal line to only see a counsellor, so our services make things easier and simpler for them. Some clients say they won’t go to the clinics for just HIV testing so us coming to them makes things easier for them and means they actually get tested. They are so excited about these services and always eager to know when the bus is coming back to the area. Lastly, we have been asked why we are always happy and smiling. All I can say is that we like taking these services to the community and that makes us happy. For more information on the MHC solution, please get in touch on info@mobilehealthclinics.net.